baptizing the multitude with the clear waters of faith into the spiritual flock of Christ. 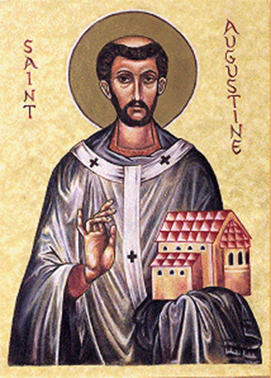 O thou boast of Canterbury, holy Archpastor Augustine. and intercede with Christ our God that our souls may be saved. Our father among the saints Augustine of Canterbury was a missionary to Kent in England, and the first Archbishop of Canterbury. He was a monk at St. Andrew’s on the Coelian Hill in Rome, when Pope St. Gregory the Dialogist (3rd September), with whom St. Augustine shares the title of “Apostle of the English”, selected him to lead a mission of forty monks to enlighten England and re-establish the Church there, which had all but died out following the fall of the Roman Empire. The missionaries landed near Ebbsfleet in the Isle of Thanet and were welcomed by King Ethelbert who, though married to the Christian Bertha of France, was still a pagan. St. Augustine and his monks based their mission at the ancient church of St. Martin in Canterbury, which had been built during the Roman occupation of Britain, and where Bertha frequently went to pray. Although the king was initially reluctant to embrace Christ, he promised not to interfere in the work of St. Augustine and his monks, and gave them free rein the preach to his subjects. In time King Ethelbert was baptised, led a holy life and, since his repose, he has been venerated by the Church as the holy right-believing King St. Ethelbert (25th February). According to St. Bede the Venerable (25th May) St. Augustine was consecrated Archbishop by Archbishop Etherius of Arles, though other sources state that it was his successor, St. Virgilius of Arles (5th March). When he returned to England, St. Augustine took to his mission with renewed zeal, building the initial cathedral at Canterbury, called Christ Church, and founding the monastery of SS. Peter and Paul (later known as St. Augustine’s). This became the burial site for St. Augustine, future Archbishops of Canterbury, as well as the Kings of Kent. St. Augustine was instrumental in founding the dioceses of Rochester and London, consecrating SS. Justus (10th November) and Mellitus (24th April) as bishops of those Sees. He also helped the king draft the earliest Anglo-Saxon laws, and founded a school in Canterbury. Despite all of these successes, St. Augustine was unable to achieve unity with the Christians in the British Isles who followed Celtic practices, a division which persisted until the Synod of Whitby, held sixty years after St. Augustine’s repose. St. Augustine was known during his lifetime as a wonderworker, and reposed on 26th May, 604. He was initially buried at the entrance to the unfinished church at SS. Peter and Paul monastery. Upon its completion, his relics were entombed inside with an epitaph which reads in part: “Here lies the Lord Augustine, first Archbishop of Canterbury, sent here by blessed Gregory, bishop of the city of Rome, who with the help of God, and aided by miracles, guided King Ethelbert and his people from the worship of idols to the Faith of Christ”. BRUNO, consecrated the nineteenth Bishop of Würzburg, Bavaria in 1033. St. Bruno personally funded the construction of the Cathedral of St. Kilian (8th July) in Würzburg. He reposed in 1045. EUTROPIUS, a native of Marseille, who was consecrated Bishop of Orange in Provence circa 455. This was a period of rebuilding and recovery for the Diocese which had recently suffered destruction at the hands of the Visigoths. In his writings, St. Sidonius Apollinaris (21st August) speaks of St. Eutropius in the most glowing of terms. St. Eutropius reposed 475. MELANGELL (MONACELLA), St. Melangell was an anchoress in Montgomeryshire (present-day Powys) in Wales. According to some she was given a grant of land by the local prince on which she founded a monastery where she served as Abbess for thirty-seven years. Her shrine is at St. Melangell's Church, Pennant Melangell, near the village of Llangynog. The church contains a fine fifteenth-century oak rood screen with carvings that tell the story of St. Melangell’s life. She reposed circa 590. RANULPHUS, (RANULF, RAGNULF), the father of St. Hadulf (19th May), St. Ranulphus was martyred (700) in Thélus, present-day France. 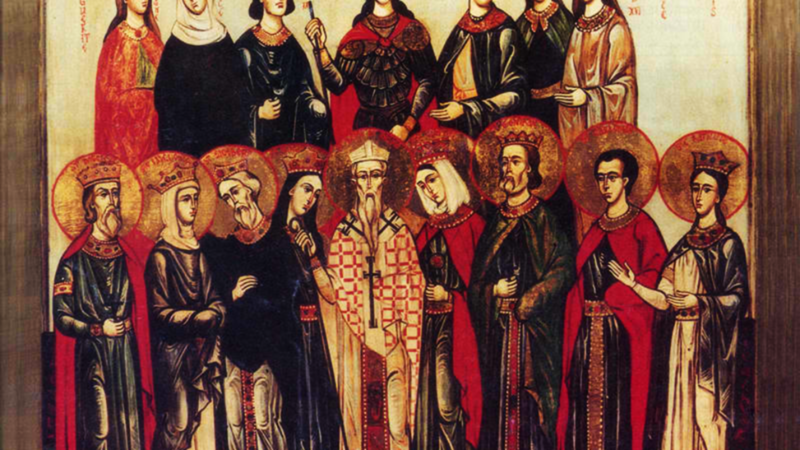 RESTITUTA and COMPANIONS, during the reign of Emperor Aurelian (270-275), St. Restituta, a patrician maiden, and several others, fled to Sora in Campania in an attempt to avoid persecution. However, they were captured in Sora, where they were martyred.